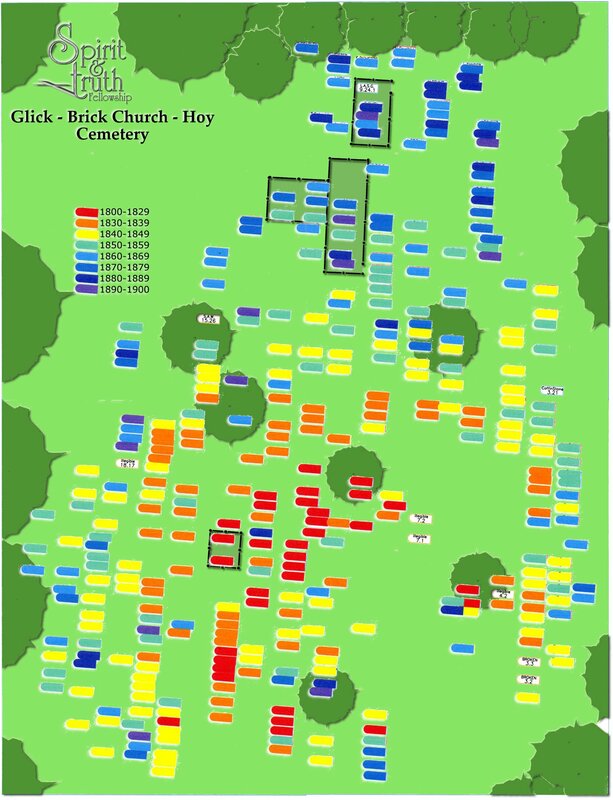 The “Glick - Brick Church - Hoy” Cemetery is now cared for and administered by Spirit & Truth Fellowship. This historic cemetery has remarkably survived years and years of neglect, but we have determined to restore it so that the history it contains can be preserved for future generations. The cemetery was founded in 1806. 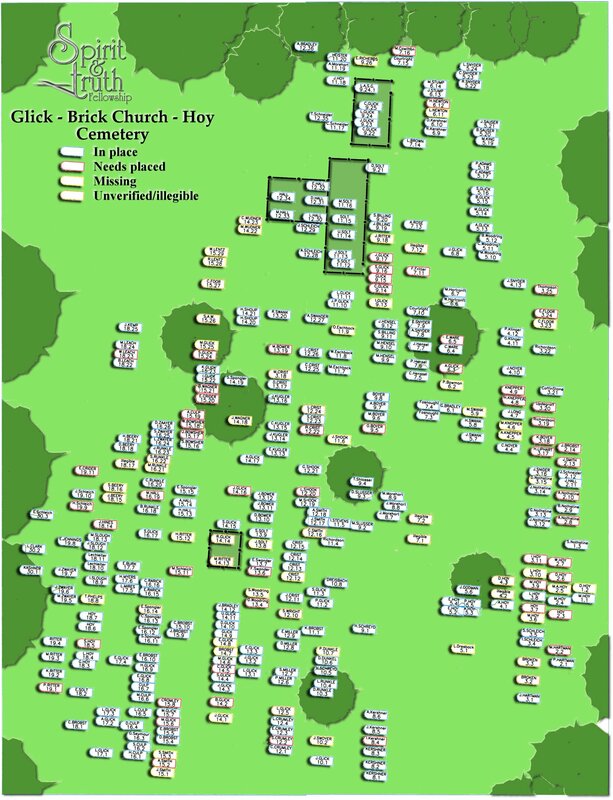 Located directly behind our church at the intersection of Alspach Rd and Cedar Hill Rd in Bloom Twp, the cemetery and the church building share a common origin and story. If you would like more information on the history of this plot of land, check out the “Building History” page on our website. There are three Revolutionary War soldiers buried here as well as the earliest settlers of this area. 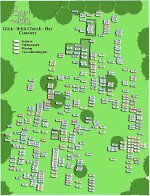 The cemetery timeline of burials is an interesting map which shows the general order of the oldest graves to the most recent graves. The image is a large file so a link to it is provided by clicking the image below. 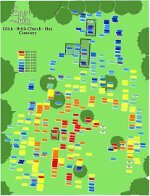 Be sure to print out a copy of this map before you come to visit the cemetery. It will make your visit more enjoyable. Take a virtual walk through the cemetery: many of the names have a hyperlink that will open an image of that headstone in a new window. It is the next best thing to seeing the headstones in person. Please let Pastor Brent Harris know if there are any broken links, errors, or discrepancies with the images or information. Please note that the highlighted names have misplaced/missing head stones or are otherwise unverified. You may contact Pastor Brent Harris if you would like additional information about any of the names listed. Would you like to help in preserving this piece of history? anyone interested in preserving this part of American history (the early settlers of Fairfield County, Bloom Twp, Lithopolis, Ohio as well as several Revolutionary War veterans). anyone who has discovered through genealogy research that this is the final resting place of one or more of your ancestors. If you would like to contribute your time and/or other resources please contact Pastor Brent Harris. 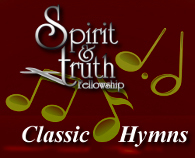 Please be aware that we are a relatively small church with a limited budget and resources. The progress of the cemetery restoration will be a slow (yet ongoing) project without additional volunteers and resources. Improvements have already begun! We would love to have your help!